I'm not sure of Helen's source for this, but it touched on some local matters that I am acquainted with and thought it worth expanding into this post. Fernando Librado was a principal Chumash informant to a famous and famously eccentric anthropologist (who will get his own post later on) named John Peabody Harrington. 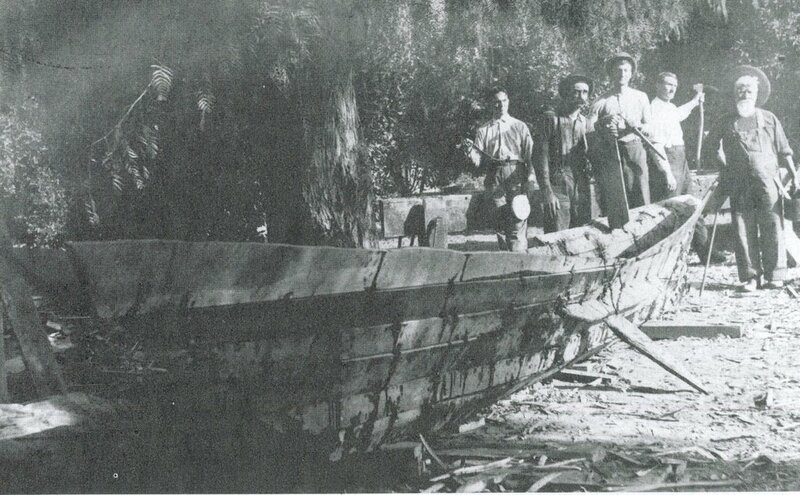 Harrington hired Librado to build the last native built tomol, or plank sea canoe, in 1912. 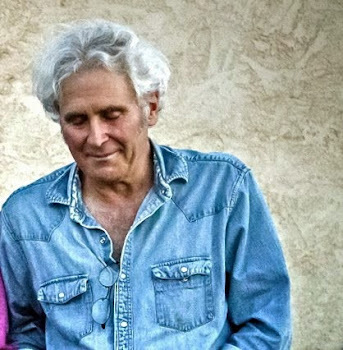 Librado was in his 70s then and was the last Chumash who knew how to build one. 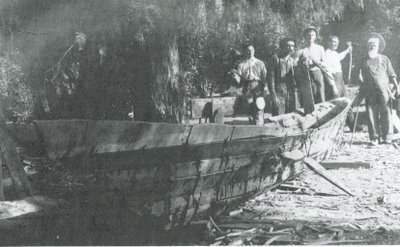 The photo above shows Librado, the white-bearded man on the right, and Harrington, the tallest figure in the group on the left, during the canoe's construction. 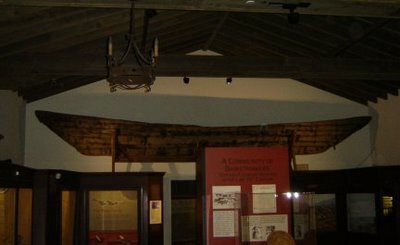 This canoe still exists, and is hanging on the wall of the Chumash Hall at the Santa Barbara Museumof Natural History, where I took its picture above. Harrington took extensive notes (2,500 pages) and made some plans and photographs of the process of construction. He also gathered much information on the Chumash social group that built and operated the tomol, a pan-village organization (each village was nominally politically independant) called the "Brotherhood of the Canoe." The spirit totem for the Brotherhood was Helek or peregrine, as Helen mentioned. In almost all Chumash myths dealing with sea canoes, the boat is captained by Helek, though he is often accompanied by his two fishing buddies, He'w (pelican) and Mut (cormorant). It is apparent I am going to have to split this into two posts to show all the photos I would like due to Blogger's content limitations.